You know body hate, that state you live in when you don’t feel good about yourself and think that your body is to blame and you try to soothe yourself with emotional eating. Maybe your body is too big or too small or too something else negative and your solutions are to emotionally eat, over or under exercise or do nothing. You hide from the world with your thoughts and feelings of discontent and unworthiness, never allowing all of your beauty to shine through. The relationship you have with your body cuts to the very core of your being. Many people have the experience of their body being used for another’s purpose. And the relationship with your body changes from connection to shame and guilt. Regardless of the boundary violation, physical, psychological or both, the pain can be pervasive. We can’t separate our feelings about ourselves from our feelings about our bodies. Keeping them separate only leads to self-deception and things never being quite right. It is a wound to your soul that needs care. Gratefully, the wounds can be healed. You can live your life free from the emotional eating that leads to a vicious cycle of attempting to heal the immediate pain and instead heaps more on. It’s an ineffective cure. The way toward healing is through active kindness. 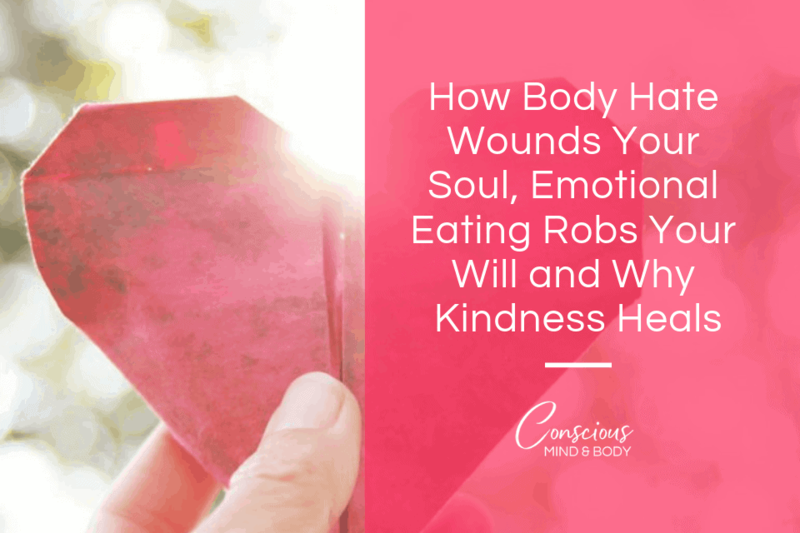 Here are three ways that body hate wounds and leads to emotional eating along with healing solutions. 1. Body hate destroys your confidence. I have spoken with countless number of people, mostly women, who speak about their confidence in so many areas of their lives. From being a great parent, to achieving top positions in large corporations, to leadership positions in community organizations, to meaningful work in government, as clergy, as educators, to entrepreneur, etc. People who have it together in so many ways that the larger society values. They are making big contributions to the world. I also talk with lots of people in not so grand positions who are also held back by their perception of their body and don’t take the risk to do what they like. They feel small and unworthy of positive nurturing attention. Those who are outwardly successful often speak about the dread they feel when they think about their bodies, just as those who are less stereotypically successful. Both sides of the success coin are not living their lives to the fullest. This thought loop, “I want this; no, you can’t have it” zaps any hope of pushing yourself through the fear and the imperfections, your humanness, that in reality will help you take your first step forward. What if you accepted the fact that your body does not determine your worthiness to live your life to the fullest? What if worthiness or feeling worthless is a judgment thrown in the path of your personal growth? You can make a decision to stop body hate and emotional eating by following the steps to become a Conscious Eater. The process can change your body and your relationship with food. You can make the decision to change the way to move your body and this can change your body too. You can make decisions while also maintaining a position of respect, love and kindness with yourself. Being in the process of change is being in the process of life. You can be where you are right now and move toward your goals and grow in the confidence that you don’t need to be at some artificial endpoint where everything is set and only then live your life. This is part of the myth of perfection that keeps you stuck. Break down your goal into smaller parts. Dip your toe in and test the water. Assess what worked and what didn’t. Make adjustments. Go a little further toward your goal and reassess. Each time you learn more, you grow in confidence and you live your life the way you need to live it and it heals your soul. 2. Body hate destroys your will. You are not a mistake. You are not a problem to be solved. But you won’t discover this until you are willing to stop banging your head against the wall of shaming and caging and fearing yourself. Maybe you have the confidence, but not the will. Perhaps body hate usurps your willingness to move forward. Action is what makes the difference between disappointment vs satisfaction. Hoping and wishing is the stuff of fairy tales. They are good. We need fairy tales to help us understand the world and the possibilities of our futures. They see past the obstacles. If only we could recall how we felt when we were small, or could imagine how utterly defeated a young child feels when his play companions or older siblings temporarily reject him or can obviously do things better than he can, or when adults—worst of all, his parents—seem to make fun of him or belittle him, then we would know why the child often feels like an outcast. Our call as adults is to shift out of this mindset. Perhaps the messages you received as a child weren’t helpful. Perhaps they didn’t support you in the way you most needed. It’s not okay and at the same time, we can’t change it. What you can do is live today with the grace that pain has given you to use your self-compassion to nurture and support you. To move beyond the pain and into a more peaceful, satisfying life is one of the most healing things you can do for yourself. Healing body hate happens bit by bit, with taking kind action filled with self-compassion heals the soul. 3. Body hate makes your life miserable. Think about the low hum of criticism throughout your day. It’s everywhere, the news, social media, drivers, weather, food and of course our bodies in size, shape, health, etc. Complaining and fault finding is way too easy to slip into. When you engage in body hate, which often results in emotional eating, you add to the negative environment you’re living in. Since it’s you that you’re living with all of the time, your thoughts are your mindset. Shifting your focus is really the only way out of the misery. Changing your focus may require you to actively filter out the stuff that doesn’t add meaningful information to your life. As you change your mindset and take the steps you need to feel better about yourself you will find that you’re less interested in the petty criticism, the stories that keep you locked in negativity, especially as it relates to your body and your health. You will also find that it’s easier to take action on the things that enhance your personal development. Not from just the “learn to love yourself” platitude, but from a deep sense that you can change. You can change your relationship with yourself. Changing your mindset with big doses of self-compassion and loving kindness nourish your ability to take the action you need to take to make your life better.